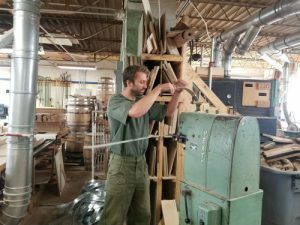 Recently I visited Kalamazoo Cooperage and spent a morning with Ben Aldrich and Gerren Young. What an exciting visit this was for me. When I arrived I knew right away this was an unusual place. The mountain of saw dust next to the building was the first clue. 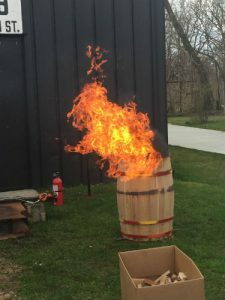 The wisp of smoke on the morning air and the smell of charring white oak barrels really peaked my interest. I have been coopering for more than 20 years. Much of that time has been spent teaching coopering at Tillers International. I love the craft of coopering; I’m always enthusiastic to visit other shops. I first met Ben in one of my coopering classes. He wanted to learn coopering and what a great student he was. Ben was a natural cooper. His skills with hand tools are outstanding. When I asked him about that he explained that for 18 years he was a pipe organ builder. A trade that required mastery of many tools and techniques. However, pipe organs are kind of going the same direction as buggy whips; not entirely gone but not in much demand. Another victim of the digital revolution. However, Ben is still busy before Christmas and Easter each year tuning pipe organs around the area. For several years Ben made his living as a cabinet maker and finish carpenter. Gerren is equally as interesting. Gerren started out in woodworking making wooden drums. What a great introduction to coopering. His drums are fantastic, with amazing woods and incredible tight joints. 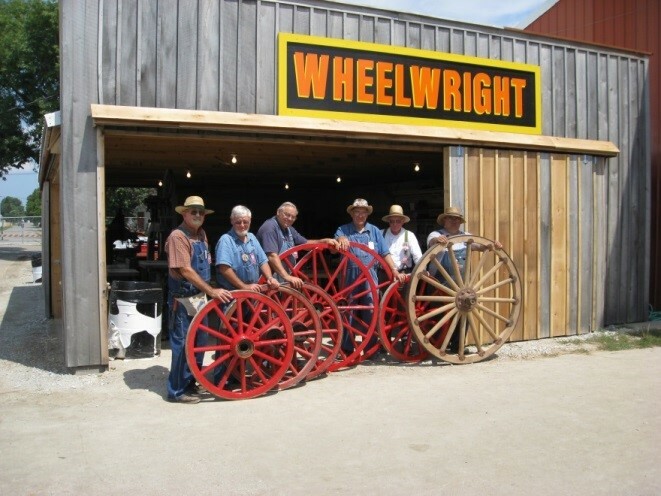 They are usually turned on a large wood lathe that he has. I first met Gerren at our woodworking club meeting. He learned about my shop and asked if he could make some special toggles for a snare drum that was commissioned. He came out to my shop and was a wiz with the metal working tools. Turns out he is also a metal artist. 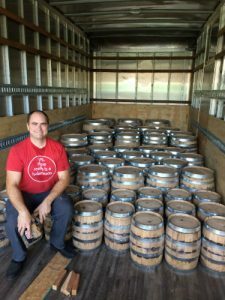 When I visited Ben and Gerren’s shop they were working on a large order of 30 gallon barrels for a regional distillery. Things were really hopping. The white oak wood is really the foundation of good barrels. Ben explained that he gets his white oak from local saw mills in Lower Michigan and northern Indiana. This area has surprising great white oak, a little known secret. 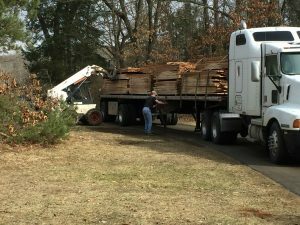 Ben buys the wood by the semi load and air dries it. Unless it’s a special order the wood is air dried about a year before the coopering process begins. When we got into the shop the first stop was the prep area where the quarter sawn white oak was broken down into stave blanks and heading billets. These billets are then shaped and molded to make the final staves and the barrels’ heads. The stave blanks are shaped on a very large industrial shaper and then run through a molding machine. The head blanks are shaped on the edge with the Z profiled molding bit and pressed together. The Z profile molding bit is a special shape. It provides a symmetrical tongue and groove type of joint. Due to this special shape only one cutter is required for both halves of the joint. The tolerance is designed to require a press fit. The heads magically stay together with a water tight fit. Ben explained that the Z profile makes a serpentine seal that is very water tight. After the staves are jointed they are raised using heavy construction rings into a weird cone shape that is ready to be fired. This is where the excitement begins. A fire is built in the center of the raised staves. When the staves are hot to the touch they are winched together to form the barrel. After the firing the classic barrel shape has been formed and the barrel is now charred or toasted depending on its future use. Back in the woodworking area the barrel is crozed. This is the process of cutting the groove in the ends of the barrel where the head of the barrel fits. Next the head is trimmed to size and beveled on the edge and fitted into the croze. The barrel is now ready for the final hoops. The hoops are made from 14 gauge galvanized steel and riveted together. 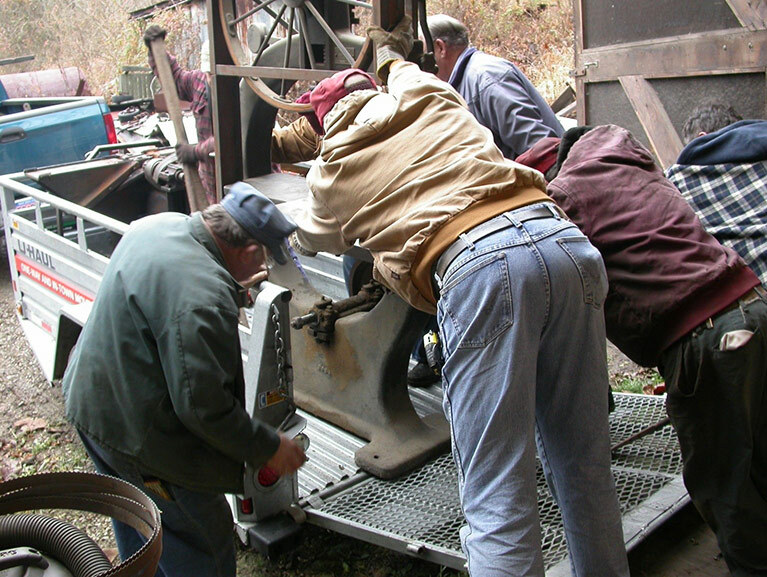 The construction bands are driven off and the final band is tightly driven on using a hoop driver. Every barrel from Kalamazoo Cooperage is leak tested. It’s rare for a leak to be detected in a joint. However, occasionally a leak occurs through the wood itself, from a defect, small hole or cracked stave. These are replaced or repaired before the barrel is shipped to the customer. What a great day I had at the Kalamazoo Cooperage. 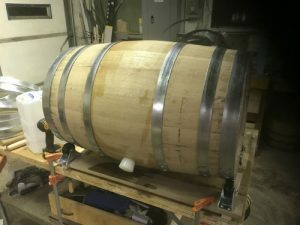 There are other places to buy white oak barrels but where can you buy a barrel that has been made by instrument builders and cabinet makers. The Kalamazoo Cooperage is a jewel, making extremely high quality barrels at a very reasonable price.